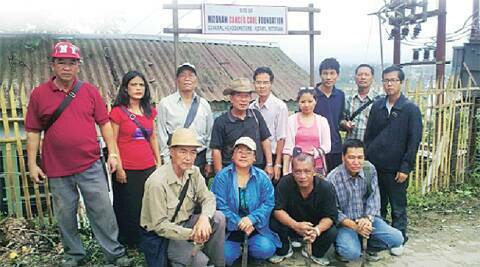 Mazami (in pink) and Pastor Maenga (standing, extreme right) with cancer patients at the Mizoram Cancer Care Foundation. When someone dies in Mizoram, public announcement systems declare the deceased’s name, age, time and cause of death almost immediately — a Mizo tradition of community mourning known as zualko. However, since last year, the cause of death is no longer mentioned because it causes unease amongst people in a state where a large number of the population is afflicted by cancer. “A public announcement discomforts other cancer patients and their family members,” says Lalbiakzuala, president of the central committee of the Young Mizo Association, which organises almost every aspect of community mourning across the state. According to the Indian Council for Medical Research, Aizawl district, which includes the state capital, has the highest incidence of cancer in India, while Mizoram as a state stands third. There are 273.5 cancer cases for every 1 lakh residents of Aizawl district, which has a population of 4 lakh, according to the 2011 Census. Mizoram as a state, with a population just below 11 lakh, comes third with 189.5 cancer cases for every 1 lakh people. Maenga does not shy away from admitting his rage — rage against doctors who did not diagnose the lump behind his ear as a tumour even though he complained about it for nine years — they operated on him four times between 2002 and 2010. And rage against what he calls the past apathy of the government towards Mizoram’s huge population of cancer-afflicted. For years, with little medical infrastructure to handle the huge population of cancer patients, Mizoram’s doctors often referred the afflicted to hospitals far afield, particularly Vellore’s Christian Medical College and the Tata Memorial Hospital in Mumbai. At the arrival gate at Chennai airport, it is not uncommon to see cars bearing “Mizo Taxi” posters that ferry cancer patients almost 140 km to Vellore, where the government even runs a Mizoram House. The lack of support systems for and by cancer patients prompted Maenga to start the Mizoram Cancer Care Foundation, a collective of patients and survivors, in March 2011. He says most cancer patients are unable to seek treatment, mostly because of financial reasons, and due to a deep sense of sorrow. “After the diagnosis, there is a pervading sense of helplessness for those affected,” he says. He works with more than 700 others at the foundation. Their Facebook group of the same name is filled with information and advice from cancer patients. In a ward at the Mizoram State Cancer Institute (MSCI), 70-year-old Maliani lies on her bed, looking up blankly at the ceiling. She has just been admitted to the hospital after being diagnosed with stomach cancer, the ailment that killed her father and elder brother some years ago. “I’ve been having difficulty eating. I’d rather not talk about it. It is embarrassing to be a cancer patient,” she says. Stomach cancer is the most common form of cancer here, with Aizawl district leading the list, Mizoram as a state coming second and Mizoram as a state, excluding Aizawl district, coming third. Other prevalent forms of cancer include cancers of the oesophagus, the hypopharynx, cervix and breasts. The district also has the highest incidence of lung cancer among both men and women, and as a state Mizoram ranks second. Experts suggest the main reason behind this is tobacco consumption; a majority of both men and women have tobacco habits. While Chief Minister Lal Thanhawla, in his speeches, never fails to mention the high cancer rate and its apparent cause, his wife Lal Riliani is at the forefront of the state’s anti-tobacco campaign. The MSCI in Aizawl’s Zemabawk neighborhood was set up in 2010. While it has quickly upgraded to facilitate most modes of treatment, except surgery (which is done at the Aizawl Civil Hospital), it remains short-staffed. Approximately three-fourths of the 1,200-odd patients diagnosed with cancer each year receive treatment here. Just outside MSCI’s main gate, the Mizoram Cancer Society runs a 14-bed inn for cancer patients who come from outside Aizawl. For a nominal rent of Rs 5 per night, the inn provides free electricity and a kitchen. Rice is provided free of cost. “Although we survive on donations, we have had more than 900 guests since 2010 when we opened the inn,” says society secretary Malsawmkima. The inn was established by those campaigning about cancer awareness. But the single woman sometimes struggles to believe in herself, especially when she is on the verge of dating someone new — the gnawing feeling of not being acceptable as someone’s better half creeps in. “When should I tell him I’ve had breast cancer? That’s the toughest part. I’ve been in two serious relationships after my diagnosis. The first time, I told him on our fifth date. The second guy knew in the beginning itself, and he acted like he did not mind but, well, it showed he did,” she says, toying with her coffee cup. “At the back of my mind, my scars are always there. They are signs of my survival. But not everyone thinks that way,” she says.